You know the drill... Heh ! It is a tale of revenge. I think Forge World made a brilliant move yesterday releasing both the rules for Space Marine Chapter Tactics and Special Characters from the Badab War. The rules are available for free so if you have access to the Internet it doesn't cost you anything (other than accessing the web). Hopefully Games Workshop will learn and of course they own Forge World. I have already seen a lot of local campaigns cropping up... It's Space Marine versus Space Marine! The Astral Claws were all but wiped out, approximately 200 survivors fled into Maelstrom and became the Red Corsairs. The remaining Secessionists from the Executioners, Mantis Warriors and Lamenters undertook a 100 year Penitent Crusade to atone for their crimes. The entire population of Badab Primaris was exterminated and the planet rendered a Dead World. 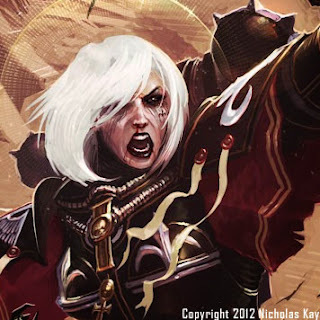 It's time to take a hard look at the Sororitas and see if they can go the distance in today's 40K. These are my Sons of Horus that are currently being painted by one of my best friends, Kenny Boucher of Next Level Painting and president of the 40k Wrecking Crew. 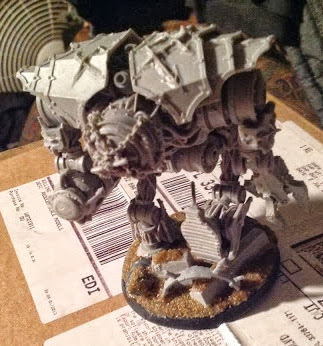 This project is a pure terminator army and if you follow this blog I am sure you've seen the beautiful vehicles and dreadnaughts painted by another very good friend of mine, Brandon Palmer of GMM Studios who is also a member of our gaming club. This is intended to be a showcase army... I can't even bring it to a 40k tournament since it was created using the rules from Forge World's first Heresy book Betrayal. I have lots of great friends here in Florida that will let me use this army in pickup games which I greatly appreciate. THE LINK BELOW WAS BROKEN BUT HAS BEEN FIXED SO YOU CAN VIEW IT NOW - MY APOLOGY !! I'll be updating the review as more information becomes available. Overall at a first glance it sounds pretty good. The new Sisters of Battle will definitely put a hurt on Psyker heavy armies such as ScreamerStar. Here is a list I will take to a local RTT tomorrow. Note that a lot of my models are out on commission to be painted so I don't have access to a lot of my typical units. I'm on travel all week and don't have much time for the hobby right now. Also a lot of my most currently used units are out to be painted on commission (three different painters actually) so I don't have access to either my beloved Nurgle or Sons of Horus. BeakyCon3 is finally over now so I what to start focusing on building a 2000 Take All Comers (TAC) army list for the upcoming Crucible 4 GT scheduled for next February in Orlando. Forge World and double FOC are allowed so I've already got some good ideas and I'm pretty sure it'll be some type of Chaos army. This year I was the only player with five wins going into the final sixth round and then lost a very close game in a mirror match to an army very similar to my Necron - Grey Knight build. Ranking is done by battle points over your W-L record so I'm going to bring something that can really rack up the points. Anyways I'll soon have some new exciting articles to share so keep an eye out for Terminus Est. 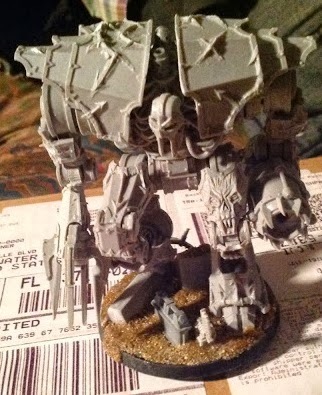 Screamerstar is the new overnight sensation for daemon armies. It features one or more Screamer units - one of which at any time can be buffed to a 2++ re-rollable invulnerable save (Tzeentch daemons always reroll a failed save of 1). Screamers are highly mobile, multi-wound, have a S5 AP2 melee attack (Lamphrey's Bite) plus they can Slash attack. The army revolves around the Screamers, Kairos the Fateweaver (aka Big Bird), another unit that has the Grimoire of True Names (GoTN) and several psychic level 3 Tzeentch Heralds casting from the Divination psychic lore. If a Herald should roll for Forewarning (blessing) it can give a friendly unit a 4++ invulnerable save. The unit with the GoTN then converts the invulnerable save to a 2++ and the Fateweaver allows the daemon player to re-roll for the Grimoire to better ensure the 2++. So there are several factors which must all occur every turn in order for the crazy buff. By eliminating just one of these factors you have greatly diminished the daemon army's central most strength. A 2++ re-rollable save is nothing new... Dark eldar|eldar armies used this tactic towards the beginning of sixth edition. The major difference now is that instead of one character tanking wounds for its entire unit, all of the Screamers in the recipient unit have the 2++ re-rollable save so the daemons are much more resilient and not susceptible to counter tactics such as barrage sniping. There is some controversy whether or not the S5 AP2 melee attack benefits from the +1 attack when charging. By a pure RAW interpretation it's only a single attack. Another controversy is whether or not Fateweaver allows the re-roll while held in reserve. Finally I believe that for a Slash attack to work the Screamers must completely pass over the target unit. It all depends upon the TO's call in a tournament - you can always ask ahead of time to make sure and not every TO will rule in favor of the daemons - it's definitely worth asking! Screamerstar can feature four Tzeentch Heralds in the unit... One carries the Grimoire, one casts Forewarning, one casts Prescience and every other warp charge point goes into Flickering Fire (S6), averaging over 40 hits a turn. This combination is highly dependent upon the Heralds rolling for the correct powers, which can be a weakness to this method. 1) As always first and foremost play to the mission objectives. Don't immediately start the game all flustered and try to be the man going after those nigh invincible Screamers... Sure the Screamers will be up in your face as fast as the daemon player can get them there but if your army is mobile and|or has many units there's only so much damage those Screamers can do. Contain them at arm's length when possible and throw speed bumps in their path to slow them down. 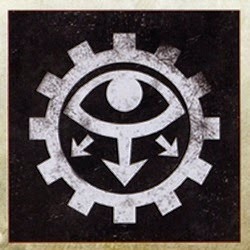 2) Focus on destroying either the Fateweaver or the unit with GoTN. Once you have destroyed either of these two units the Screamers are then much more manageable. 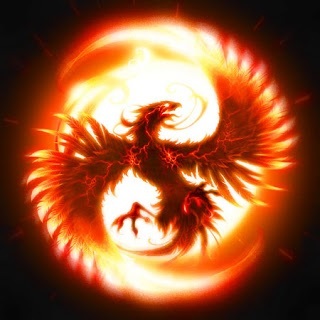 While the Fateweaver is very resilient there are certain armies that have the right tools to quickly and efficiently shoot down Big Bird - Necron armies with lots of Night Scythes and eldar armies with lots of Wave Serpents both immediately come to mind. Tau can dedicate seeker missiles if necessary. Big Bird doesn't like any flakk either (no pun intended). If you focus a lot of fire power on Kairos another advantage it is more likely the daemon player will have to use its re-roll to protects their precious Big Bird. If Fateweaver is held in reserve then first focus on destroying the unit with the GoTN. This strategy puts the daemon player on their back foot forcing them to play more defensively thus blunting some of their offensive strength. If you can dictate the course of the game then you're much more highly likely to win. You can also focus on destroying the Herald casting Forewarning as well. There could be multiple Heralds casting this psychic power - it's best to focus on first removing one element that will stay gone. The unit casting Forewarning must be within 12" of the recipient Screamers so it's not all that easy for the daemon player to hide... Sometimes they will be the easiest unit to reach out and hurt. 3) Don't play to the daemon army's strengths. You can waste a lot of fire power trying to shoot down a multi-wound unit with a 2++ re-rollable invulnerable save. You might be able to tie them down for awhile in close combat but still you're not going to put a serious dent into those Screamers. 4) One major weakness of Screamerstar is typically the Screamers are not a scoring unit. This is an advantage for you in any mission that features multiple objective markers. Of course if the mission is The Scouring then you'll have to take it on the chin but that should be only one in every six missions. 5) Certain armies have really good tools to quickly banish the Screamers and|or limit the psychic capabilities of the daemon army. 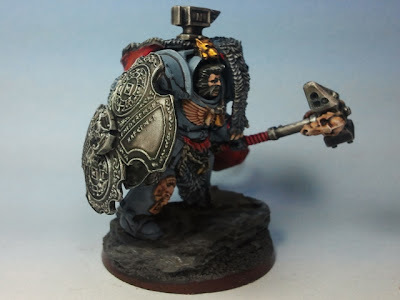 Space Wolves have access to the Rune Priest - his rune staff blocks any enemy psychic power on the roll of a 4+ within 24" and Jaws of the World Wolf can make those Screamers disappear really quick. 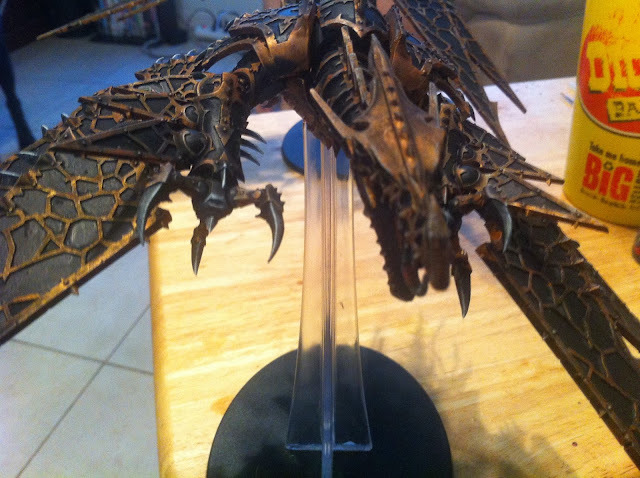 Tyranids can use their Shadows in the Warp to greatly diminish the daemons' psychic powers and this is very easy to do with winged Hive Tyrants. Drop pods can easily deliver units to target the daemon unit with GoTN - it's well worth sacrificing one unit early in order to eliminate this key. I have provided simple guidelines how to beat the Screamerstar. Just like any other army it has its inherent weaknesses which you must exploit to win. The main key to victory is destroying the units buffing the Screamers, not the Screamers. Three things must happen each turn in order for the Screamers to have a re-rollable 2++ save. Focus on whichever of these three (i.e., Fateweaver, unit with GoTN or the Herald casting Forewarning) is the easiest to eliminate first. Do not play to the strengths of the daemon army or you'll most surely lose. 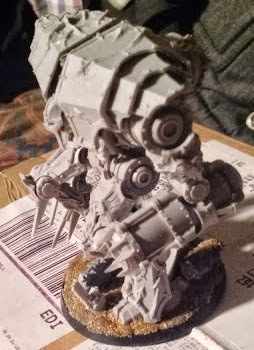 Certain armies such as Space Wolves and Tyranids have in-built natural counters to Screamerstar... Use these to your advantage. As always play to the mission objectives and the inherent strengths of your army. If you follow this advice you'll soon be well upon your way to a decisive victory versus Screamerstar. There were no eldar in the top bracket which was kind of surprising and there were definitely some very good eldar players present. Necrons and Tau were the top two races along with a strong showing for the Orks... Gork and Mork both are proud. Armies were 2250 points, double FOC, and allies. Some Forge World (40k Approved only) was allowed. Each round was three hours and the majority of the games made it to at least the fifth turn... So time was not an issue The format was W-L with battle points to help facilitate rankings from round to round for Swiss pairings. We originally had 32 players for five rounds to produce one best overall winner (Marc Parker) with a perfect score of 5-0. Only one player dropped for the start of the second day. All of the tables had a lot of terrain with some line of sight blocking... I think this really helped the top two Necron armies which both were heavy assault (i.e., Scarab Farm and Wraithstar). Line of sight blocking terrain balances sixth edition as demonstrated by these results. Space Marines did not fare that well at BeakyCon3. I think it's too early to draw any major conclusions in regards to the new Space Marines since only one month has elapsed since it's release and I did not see a lot of the new units such as Centurions or grav weapons in general. Probably there will be more telling results by the end of the year at other major events. We are already discussing how to adapt for next year such as limiting choices for any particular unit such as Wraiths or Annihilation Barges to four at most for elites, fast attack and heavy support. Of course there will be some new codices released between now and then so we'll need to take that into account as well. Whatever we come up with it will be something special again that no one else can offer anywhere. Marc Parker won going 5-0 to firmly clasp the title of Warmaster. To paraphrase Marc there aren't too many easy matches in the state of Florida anymore. There were a lot of strong armies at BeakyCon3 this weekend. Marc was running a Necron scarab farm army with Immotekh and Coteaz as a Grey Knight ally for a re-rollable 4+ Seize the Initiative... Pure genius. Double FOC meant lots and lots of Spyders. No melee is not dead in spite of what many so called Internet meta experts want use to believe. Well done.